February 4, 2016 by Ecommerce News. About Acquisition with tags Germany. 4590 views. 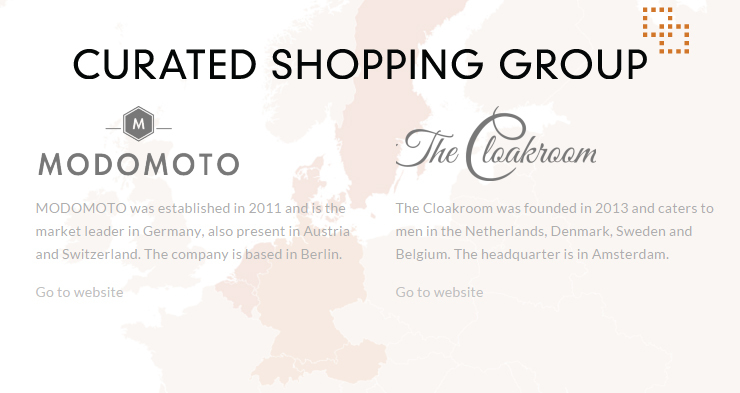 Personal shopping service Modomoto from Germany has acquired The Cloakroom, a similar service from the Netherlands. With the acquisition and an additional investment from the former CEO of Booking.com, Modomoto is now forming the Curated Shopping Group, ready to conquer the European market. The company didn’t disclose how much they paid for The Cloakroom. Modomoto announced the news in a press release [pdf], thereby claiming it was the first company who introduced curated shopping as an online service in Europe four years ago. It is said to be the market leader in Germany, whilst also selling its service in Austria and Switzerland. And with the acquisition of Amsterdam-based company The Cloakroom, the newly formed Curated Shopping Group will be the European market leader in this rapidly growing market, Modomoto claims. The new company now has 250 employees and serves more than 300,000 customers in 7 different countries across Europe. Modomoto was founded in Berlin in 2011 and performed well without any major venture capital investments. It achieved a turnover of “significant double-digit millions” last year. The Cloakroom was founded in Amsterdam in 2013 and offers its service in the Benelux and Scandinavia. In these markets, the company will continue under this brand, while founders Asbjørn Jørgensen and Kasper Brandi Petersen will join the management board of Curated Shopping Group. Kees Koolen, former CEO of Booking.com is one of the early investors in The Cloakroom and will accompany Curated Shopping Group in the future as an investor and advisor.